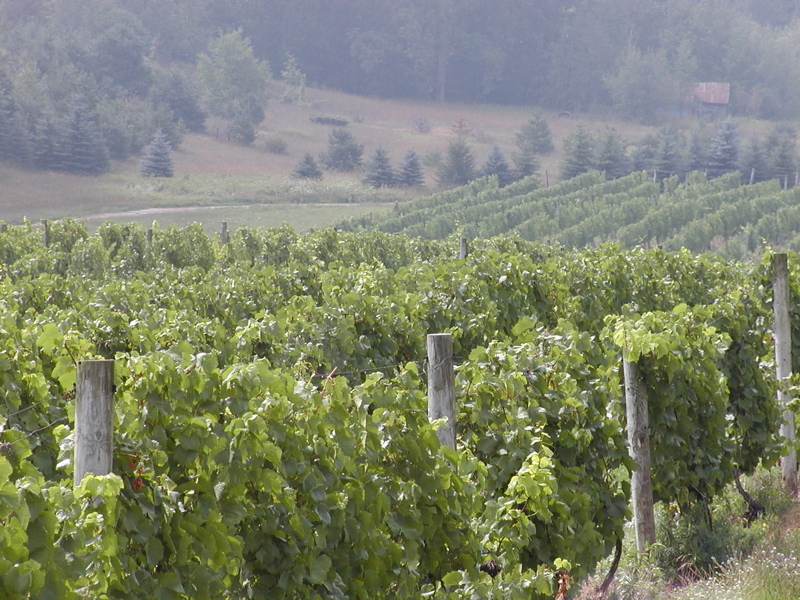 Chardonnay Vineyard at Chateau Fontaine in Leelanau County. Image: Andrew McFarlane. Michigan’s wine industry continues to grow with the number of approved commercial wineries rising from 55 to 138 in the past 10 years. Although Michigan is the fourth-largest grape-growing state, an inadequate supply of Michigan-grown grapes, rather than possible oversaturation of the market, might be the industry’s major concern, said Karel Bush, the executive director of the state’s Grape and Wine Industry Council. Current in-state and out-of-state markets are sufficient for existing wineries to survive, Bush said. So is the acreage for vineyards in the state. As a co-owner of Spare Key Winery, a newly approved winery in Charlevoix, Jean McCarthy said she doesn’t believe the state is oversaturated in the number of wineries. The other newly approved wineries are in Baroda, Detroit, Hastings, Shelby Township, Roseville, Watervliet and Onsted. The wines made in Michigan are similar in style to classic European wines that consumers are familiar with. Bush said that beyond the state’s borders, Michigan wines are appearing in restaurants in New York, Washington, D.C. and even San Francisco. “Those placements are the result of very hard work on the part of the winery, establishing relationships with chefs and wine professionals in key markets,” Bush said. Peter Anastor, director of the Agriculture Development Division in the Department of Agriculture and Rural Development, said the agency is promoting wineries, including educating winery owners about exporting their products to international markets. “And we also try to promote our products as much as we can throughout the country and make sure people are aware of some of the attributes of Michigan wines,” Anastor said. According to Bush, the largest out-of-state market for Michigan wineries is Illinois, especially the Chicago area. Gov. Rick Snyder mentioned the industry in his recent State of the State address. “The economic impact of that industry is now $5.5 billion industry, up from $300 million in 2005,” he said. Michigan wineries supported more than 47,000 jobs and contributed nearly $253 million in tourism spending last year, according to the Grape and Wine Industry Council. One of the primary challenges the industry faces is an inadequate supply of wine grapes grown in the state, Bush said. Also, a spring freeze is a double-edged sword for growers. New technologies have been brought into the industry, such as Flash Détente introduced at Black Star Farms north of Traverse City. This technology reduces negative effects of widely changing weather on grapes. It improves grape colors and flavors to produce higher-quality red wine. Besides the technologies, the state is providing education and training to grape growers and wine makers. For example, Bush said the Grape and Wine Industry Council organizes an annual conference with sessions on grape production, wine production, business management, sales and marketing. The 2018 conference is scheduled for Feb. 28 through March 2 in Kalamazoo. “Michigan State University Extension also has an education program for all agricultural operations, including grape growers,” Bush said. Anastor said he’s confident about the future growth of the industry. “There’s a lot more capacity to grow wine grapes here in Michigan and to increase the volume of production,” he said.